In 1991, I got a call from my friend Matt Federgreen, the proprietor of the Beverly Hills Baseball Card Shop and my co-host for a little segment I did on each of my half-hour-long Sunday night sportscasts on KCBS-Channel 2 in L.A.
Matt had been approached by Bruce McNall, the owner of the Los Angeles Kings and at that time the rising figure in hockey ownership and L.A. sports moguldom. McNall had made his millions buying and selling (and as the jury later agreed, often selling and re-selling and re-re-selling) antique coins, and he was fascinated by the upcoming auction of the Jim Copeland sports memorabilia. 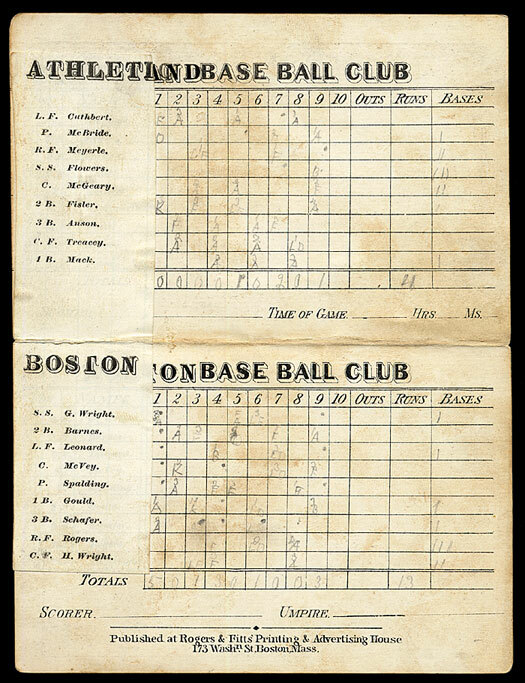 Big-money auctions were nothing new to the baseball card world, but this one was being handled by Sotheby’s, meaning the hobby was being mainstreamed into investment-grade collectibles. “The” Wagner, inside its “authenticity” plastic case that guarantees it hasn’t been altered or improved, except for the fact that it was altered AND improved. The photo is by Linda Cataffo. 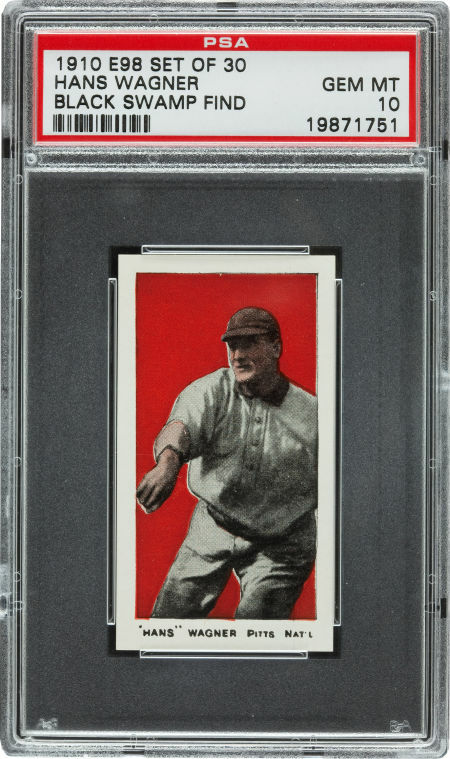 The centerpiece of the Sotheby’s Auction was an unbelievably pristine copy of the 1909 American Tobacco Company card of Honus Wagner, hardly the scarcest, but handily the most famous, card in the landmark series we collectors call by its catalogue number “T-206.” McNall and a then-unidentified partner (who proved to be his star player, Wayne Gretzky) wanted the card and they wanted Federgreen’s expertise. The card looked brand new. It bore no earmarks of being a clever counterfeit. But it also bore no signs of nearly 92 years of aging. Unless somebody was standing at the printing press when the card was finished drying, and stuffed it between the pages of a book, and kept the book in a climate-controlled room from the opening days of the Presidential administration of William Howard Taft, and had only taken it out after the inauguration of George H.W. Bush, something seemed wrong. Something was very wrong. I couldn’t go with Matt to the inspection of the Wagner that McNall had arranged for him. But Matt took a bunch of pictures, and the next time he came in to the studios he brought them. Matt’s eyes lit up. By the following Sunday I had found in my rabbit’s warren of card-related stuff, photos of a Wagner that had been offered for sale in the early ’80s by a fellow who owned a baseball card store on Long Island outside New York City. I had no doubt and neither did Matt. Between his photos and mine we were looking at before-and-after shots of the same card. Before and after somebody with the guts of a burglar and the skills of a circumcision specialist had trimmed the thing. In its previous state the Wagner was an anomaly. It had very large white borders, and the card was thus perhaps 10% bigger than the average T-206. It looked like it had been hand-cut from a sheet of cards, and not done by a machine. Some of the corners were stubbed and worn from age. But the “face” of the card, the player’s image, the bright yellow background, the lettering, were shiny and virtually perfect. It had been handled, and handled an appropriate amount, since 1909. But whoever had done the handling had been very, very careful not to touch the face. And then somebody bought it and actually cut away all the damage on the sides and sold it to Jim Copeland who had turned it over to Sotheby’s which would shortly sell it to Bruce McNall and Wayne Gretzky for $451,000. When McNall was exposed as a crook who would sell the same priceless coin to several different collectors (throwing in secure storage of it for a small additional fee – so that it was always around for him to show it and re-sell it to another collector even though he didn’t own it any more) Gretzky got full possession of the treasure and sold it off to Walmart as a publicity thing, basically at a break-even figure. The price has gone up and up and up, and “the” Wagner was finally sold to Conservative political figure and Arizona Diamondbacks’ owner Ken Kendrick, who five years ago paid $2,800,000 for it. It’s not a fake. But it’s also not an original. And for years, collectors and experts have murmured about the process by which a really nice Wagner had been altered, and the alterations hidden from the public (even receiving the stamp of approval by the presumptive “final word” of a card authenticating company which got enormous publicity – and undeserved credibility – for encasing the card in the first of its plastic “slabs”), and the card became the image of the sports memorabilia hobby. But who was behind this? And, Heavens, who cut the card? 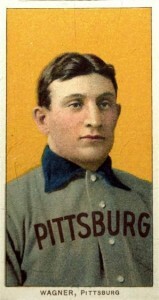 According to the indictment, in advertising portraying Mastro Auctions as the premier seller of valuable items, including the world’s most expensive baseball trading card, a Honus Wagner T-206 card, Mastro allegedly failed to disclose that he had altered the Wagner T-206 card by cutting the sides in a manner that, if disclosed, would have significantly reduced the value of the card. The “Mastro” in question is Bill Mastro, who I have known since we were both teenagers. 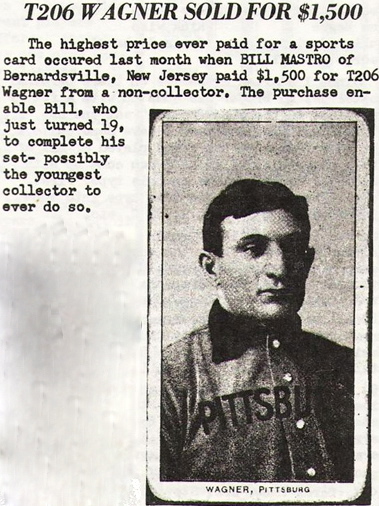 At age 19, he had bought a Wagner for $1,500 and thus completed his T-206 set. Those of us whose own massive collections might have been worth a total of $1,500 were aghast. My friend and mentor Mike Aronstein told me that some of Mastro’s relatives had actually gathered together to consider what we would now call an “intervention” or forcing him to seek psychological help. It was believed that no Wagner had previously sold for more than around $250. At the left is how this startling development was contemporaneously covered by a monthly publication I used to write for called The Trader Speaks. Mastro was already buying and selling cards that were not intended for his own collection. By the ’80s he had gone from card dealer to the founder of one of the first sports memorabilia auction houses, Mastro Auctions, and would regularly work the phones to try to drum up publicity for his auctions. It eventually became a $50,000,000 business. And now it’s gotten Mastro and some of his colleagues indicted. And not just for the deception regarding the Wagner. CHICAGO — Online and live auctions of sports memorabilia and other collectibles conducted during the 2000s by the former Mastro Auctions, which was based in suburban Chicago, routinely defrauded customers, according to a federal indictment unsealed today. William Mastro, who owned the former business that once billed itself as the “world’s leading sports and Americana auction house,” together with Doug Allen and Mark Theotikos, both former executives of Mastro Auctions, were indicted on fraud charges for allegedly rigging auctions through a series of deceptive practices, including so-called “shill-bidding,” designed to inflate prices paid by bidders and to protect the interests of consignors and sellers at the expense of unwitting bidders. In short, if you bought from Mastro, you stood an excellent chance of bidding against people who were there only to drive up the price. For that part of the story, I refer you to the whole press release at the Sports Collectors Digest website. The New York Daily News has even more detail on the extraordinary tale of “the” Wagner, which after two decades of whispering, we can now shout: has been deceptively altered. Just for fun, I should note here that the entire story of what originally made the Wagner card scarce in the first place also doesn’t add up. The timeline is so messy that it has the card being withdrawn at Wagner’s behest (supposedly because he didn’t want to be involved in selling cigarettes to kids) after he saw an advertisement for it in a national sports magazine. But the ad didn’t appear until July, 1909 and the card was supposed to have been withdrawn in March, 1909. But I’ll save that tale of what might’ve been the first card made deliberately scarce, for another time. Also, this isn’t the scarcest card of all time, nor even in this set (there are at least 75 of them; there may not be as many examples of the T-206 card of an A’s pitcher named Eddie Plank, and there are only three or four copies of a rare T-206 variation of a Yankees’ pitcher Joe Doyle, and there are unique examples of eight minor league T-206 ‘proof’ cards featuring players who never got into the issued set, and based on recent developments there may yet be a 525th card to add to the checklist). More on that some other time. Sometimes – whether you merit it or not – you seed the Publicity Storm Cloud just right with the chemicals and you get eight inches of rain. 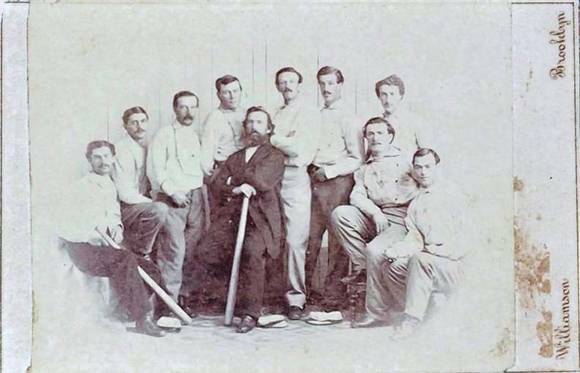 Such it was yesterday when a respected memorabilia auction house put out a story about the discovery of some hundred-year old baseball cards in an attic in Ohio. I have a little less than 400,000 followers on Twitter and it feels like half of them sent me a link, wondering if I would be buying what each and every article described as three million dollars worth of cards. As near as I can tell, the story was picked up by ABC, CBS, NBC, ESPN, Fox, AP, Forbes Agence France Presse, TASS, and Pravda. As I washed my face before bed last night and flipped on the radio, the story was on the CBS hourly newscast. I’ve dealt with the auctioneers – Heritage – for years with nothing but professional results, and I’m accusing them of nothing but professional success here, but boy oh boy oh boy did they hype this thing. Now, don’t get me wrong. Finding 1909-10 baseball cards in pristine condition in an attic at Defiance, Ohio, is a wonderful story and the cards are worth a lot of money. But comparisons to unique artwork (“It’s like finding the Mona Lisa in the attic,” said the finder) and the three-million dollar pricetag are ludicrous. 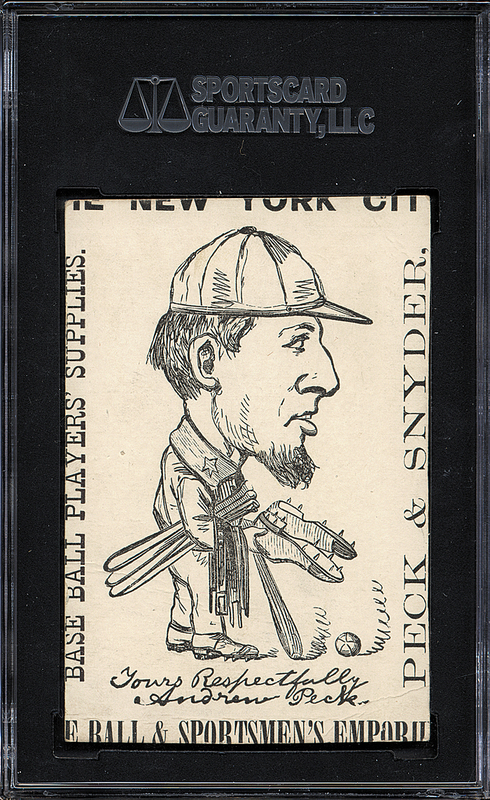 There are 30 cards in the set, issued by an anonymous candy manufacturer during the baseball card craze of 1909-11. 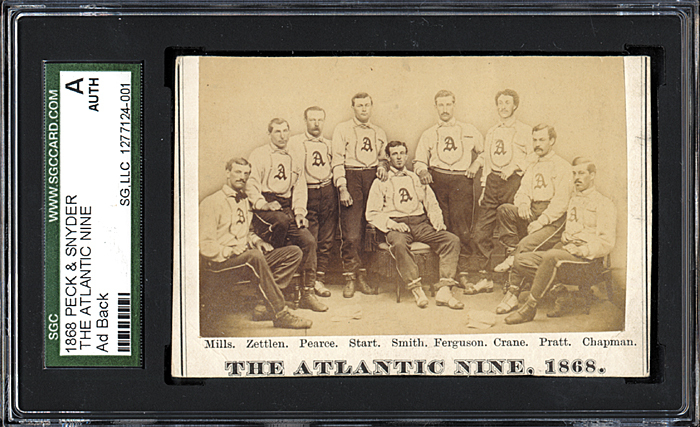 Labeled within our hobby for cataloging purposes as “E-98” (the “E” is for “Early Candy and Gum”) the cards are scarce compared to other more plentiful issues of the time (yet there are 15 of them available right now, in lesser shape, on eBay). They also just aren’t that popular. In an era in which the candy companies produced extraordinarily beautiful lithographs of players stylized to look like Greek Gods with blazing sunsets behind them, E-98’s are pretty bland colorized black-and-white images set against one-color backgrounds. The set is also full of careless errors (if you look at the card of “Cy” Young, lower left, you’ll notice it shows a lefthanded pitcher. 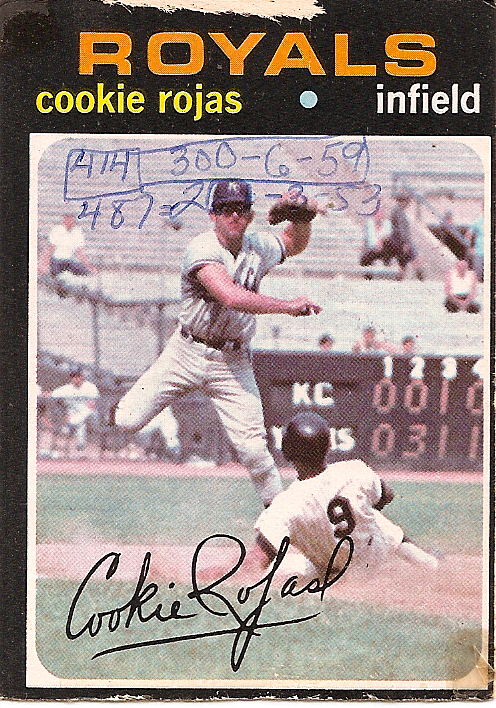 Cy, who only won 511 career games, was a righthander. The photo actually depicts a very obscure contemporary named Irv Young). Here’s what I mean about relative attractiveness. 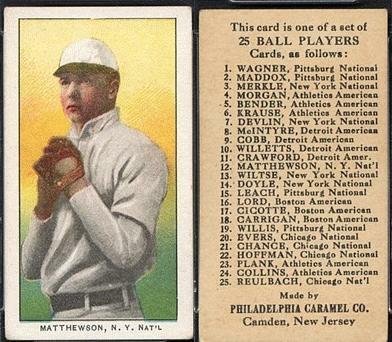 The Mathewson and the Wagner below are from the E-95 set issued by Philadelphia Caramel in 1909. Find me 700 copies of them in superb condition and we’re talking. 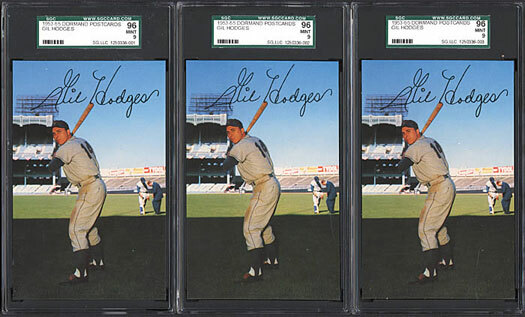 : Nevertheless, baseball card price guides agree that a full set of all 30 E-98 cards should be valued at about $125,000 in near perfect condition. 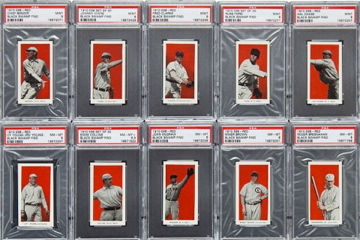 The 37 cards that the auction house, Heritage, plans to sell next month, are the best of the bunch, real beauties with sharp corners, the kind investors love. The problem is that there’s only one thing that investors react to more than beautifully conditioned old cards. That would be the sudden “find” of a large lot of previously hard-to-find cards. From the time it came out in 1953 or 1954, a Dormand Postcards issue of Gil Hodges of the Brooklyn Dodgers was wildly scarce. In the days when regular cards from the series fetched a dollar or two and even a Mickey Mantle cost only $5 or $10, Hodges was “worth” $400. Then a few years ago somebody found a stack of them. I mean, like 750 of them. Like, however many they made and didn’t distribute for whatever reason back in the ’50s. Right now on eBay you can get your average Dormand postcard for $25 to $45. Hodges? Well, you can buy-it-now for $750. That’s $750 for 42 copies of the Hodges card (some poor guy, meanwhile, is still trying to sell his one pristine-looking Hodges for $2,000). If you read the entire story of the “attic find” in Ohio you’ll notice that what they discovered wasn’t just 37 old cards, but 700 of them. The family and the auction house aren’t saying specifically what the rest of them are, but the way these things work, if there weren’t a lot more of the E-98 cards (presumably in lesser condition) than they’d be auctioning them off, too. If they were more valuable, or more intriguing, or just from a more collected or beloved set of cards, they’d be publicizing them. So, congrats to the owners of the “find.” The estimate for what an auction next month at the national collectors’ gathering in Baltimore – $500,000 – might be a little high, but it’s probably in range. Investors will invest in anything, especially if they’ve read about it in the news. But even some of the news articles indicate that there are less than 700 of these E-98’s registered and encased in plastic (as in the illustration) with an unknown larger supply in “raw” (that is, not encapsulated) condition. If you introduce 700 new ones into the market, the price will initially go up, and then way, way down. The family and the auction house have a stack of 700+ cards from a set nobody really collects and which investors might begin to doubt. Don’t forget to wave to the Gil Hodges Dormand Postcard when you pass it. Yes. But not the Honus Wagner. The Honus Wagner – from the American Tobacco Company 1909 set called “T-206” has been sold for $3,000,000 by itself (in perfect, albeit altered condition) down to the $300,000-$400,000 range for the crappier ones. “The” Wagner is on the right. 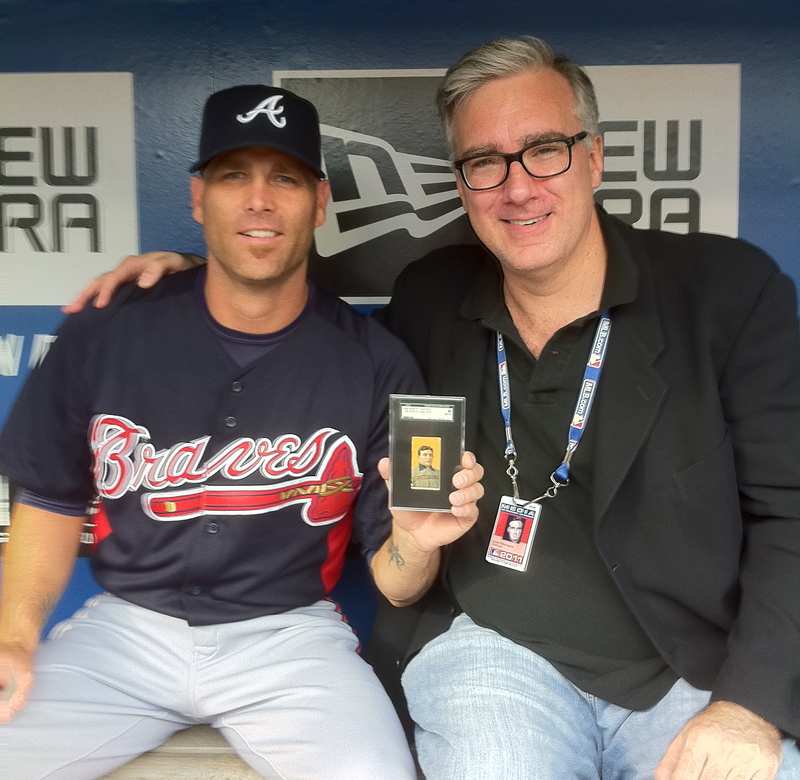 “My” Wagner meets baseball historian/Braves pitcher Tim Hudson last year, in the middle. The E-98 Wagner is on the right. Last year, after a lot of hard work and a willingness to change what he had done all his life, the former collegiate superstar finally lived down his reputation as a man most famous for one of his baseball cards, and is now “just” a top flight hitter on what might quickly become a tremendous offensive machine in Kansas City, and this is “just” what his 2012 Topps Heritage Card #51 is going to look like. Even most non-collectors remember the brouhaha six years ago at this time when cards of Gordon appeared in the 2006 Topps and 2006 Topps Heritage sets – even though the MLB Players Association had recently codified the rules about who could and couldn’t be in big league card sets. It was comparatively simple: if you hadn’t already played a major league game, you couldn’t be included in a major league set. 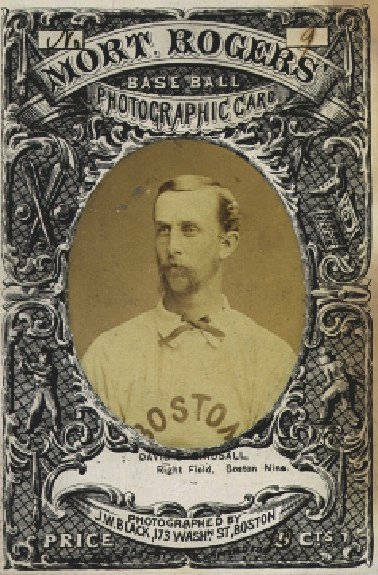 Topps, either accidentally (or many critics say, deliberately) got confused because that one rule meant Gordon – with 0 major league games under his belt – was eligible to be included in one of its brands, Bowman, but not eligible for its two others, Topps and Topps Heritage. Gordon cards were made for all three sets and the MLBPA screamed bloody murder and just before the sets were released, the cards were supposedly pulled out of the packs of Topps and Heritage. 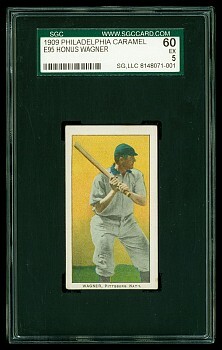 The regular Topps set was released first, and cards of Gordon with a two-inch square hole in the middle started appearing in the packs (a ‘punch’ of some sort being used to destroy the inner portion of the cards while they were still on the uncut sheets, and the sheets were still stacked at the printers’). Not long after, full versions of the card appeared, some of them in packs shipped to PXs at American Military Bases in Germany. 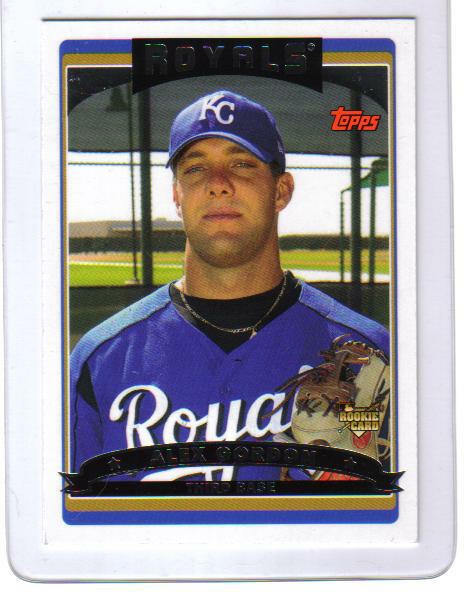 If you think the thing with the Skip Schumaker “Squirrel” card is crazy, it pales in comparison to L’Affaire Gordon. I bought a few of the cards at four-figure prices on eBay, on the premise that this was the first regular Topps card ‘pulled’ from circulation since at least 1958. I was actually accused of being some sort of shill for the thing, because I consult on Topps’ retro issues; in point of fact I learned about the card’s scarcity on ESPN’s website, weeks after it came out. 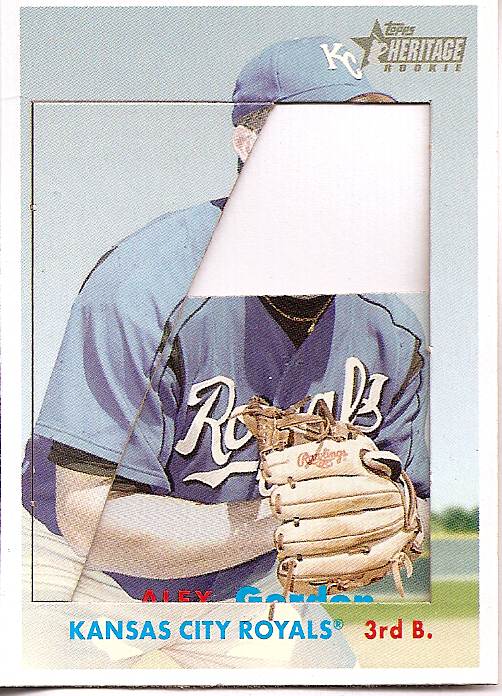 Topps estimated that maybe 50 to 100 of the Gordon cards got out, and maybe an equivalent number of ‘cutout’ cards. In the spring, however, a longtime dealer friend told me he’d been offered a large quantity of them. “I can get you 500 of them if you’ll pay the price.” Needless to say, I didn’t. As of this writing, there’s exactly one of them on eBay, but I’m confident that the number in circulation is closer to 1,000 than it is to 100. 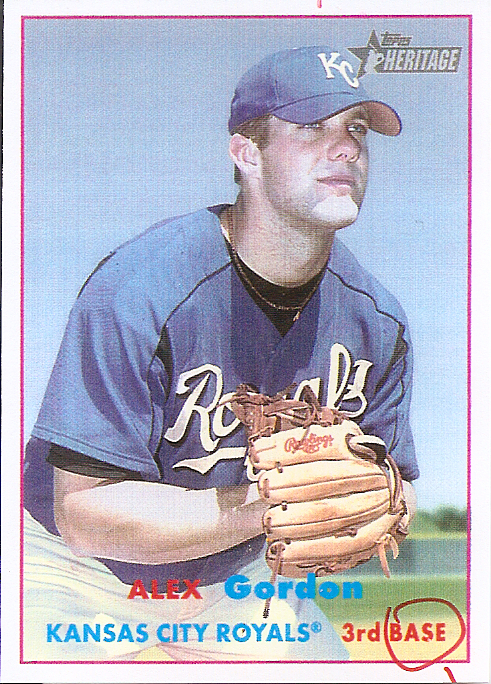 2006 Topps Heritage #255 Alex Gordon cutout card with two "fragments"
Weeks later, Topps Heritage hit the stores and sure enough, the #255 Alex Gordon appeared – but only in cutout form. This frame-like card still shows up at times, although only a few of the fragments from the cutout parts ever hit the hobby. You can see from the little Frankenstein-like assemblage of parts here that there must’ve been a third “fragment” there bearing Gordon’s face. This was the only time Topps ever actually issued a jigsaw puzzle kind of card (although they experimented with a set of them in the early ’70s – and it bombed). One wonders if somebody opened a pack of 2006 Heritage and found these little pieces of junk without realizing what they were, and tossed them. 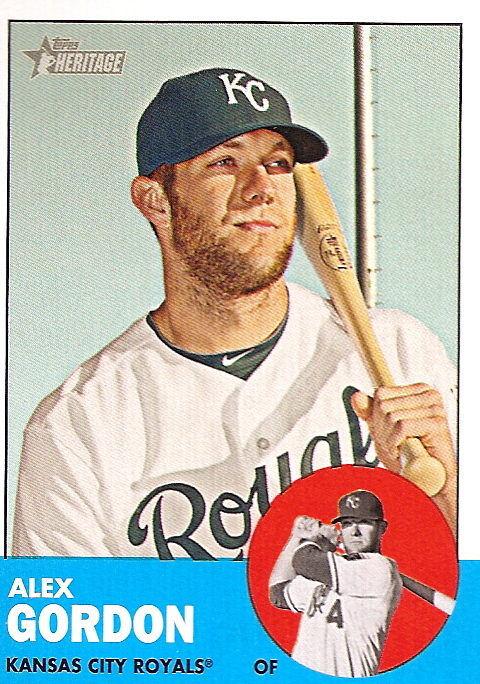 In any event, six years and five Alex Gordon Topps Heritage cards later (2008, 2009, 2010, 2011, and 2012), a full uncut version of the #255 2006 Heritage has never turned up. But I think it’s time for me to confess that I have one – sorta. We end as we began, with the fact that Topps indulges my long-standing fascination with their production process by donating the occasional proof sheet or printout to my Unintentional Museum. It never fails. Go looking for anything – from your comb to your Jamie Roseboro 1990 Bowman Glossy Baseball Card, and invariably you’ll stumble across something else. 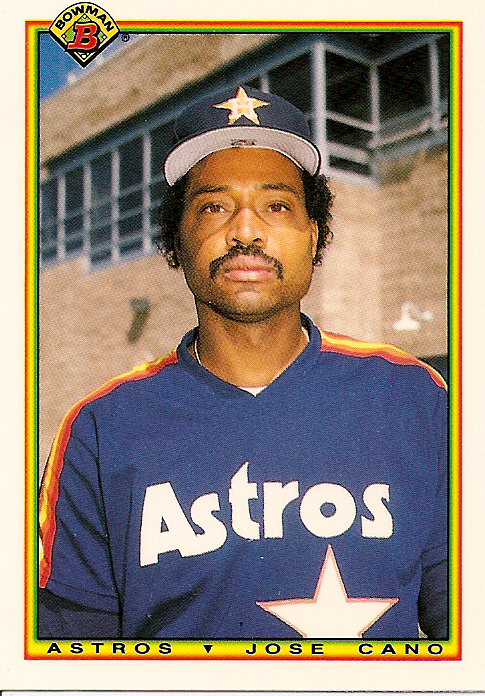 Which explains this card of Robinson Cano’s father, Jose. You may have seen him throwing (and rather successfully) to his son at the Home Run Hitting Contest before the All-Star Game. But the elder Cano actually became associated with the Yankees a quarter century before his son made the team. He signed with them as an 18-year old free agent out of the Dominican in 1980, but lasted just three games with their rookie league team before going home. Little Robby was born two years later, and then Dad returned to this country – and the minors – in ’83 in the Braves system, and made it to the majors in ’89 with the Astros. He pitched only six games, but started three of them, and actually pitched a pretty neat looking seven-hit complete game win over the Reds on the penultimate day of the 1989 season. That would be his last big league appearance, though he did get on two cards in ’90, and this is one of them. The next thing to fall out of the fast pile of stuff that is “the collection” is nothing less than a 1977 TCMA card of a career minor league infielder who would only play 88 games higher than A-ball, and then branch off into another field. Yes, that’s the same Scott Boras, agent to the stars and scourge of general managers and owners everywhere. 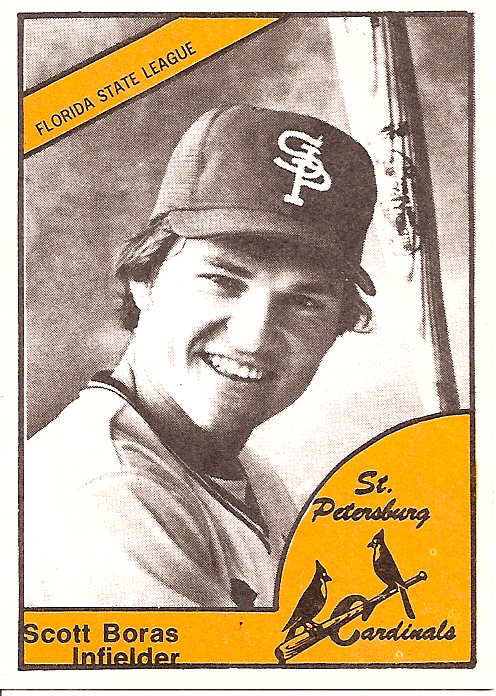 Boras spent a little more than two seasons with the St. Petersburg Cardinals of the Florida State League, and would actually hit .346 in 22 games during the season in which the card was made before moving up to AA and then winding up in the Cubs’ system. His knees gave up on him, and he went to pursue an alternative career – as a pharmacist. He got that degree and then one in law, and then wound up representing his high school teammate, former big league infielder Mike Fischlin – and the rest was a history of gnashed teeth. Mostly a second baseman and third baseman, Boras actually has some good company in that ’77 set: later Cards’ second base hero Tommy Herr, current Pirates’ pitching coach Ray Searage, and other future major leaguers like Benny Joe Edelen, John Fulgham, John Littlefield, Danny O’Brien, Kelly Paris. 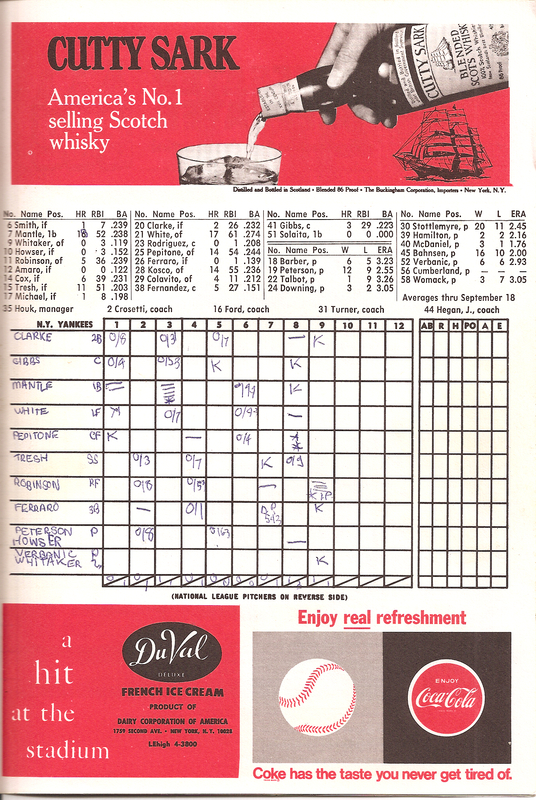 But my favorite rediscovered find is a (slightly) mislabeled 1968 Yankees’ scorecard. The reason I’m showing the cover will be explained below. Yep. 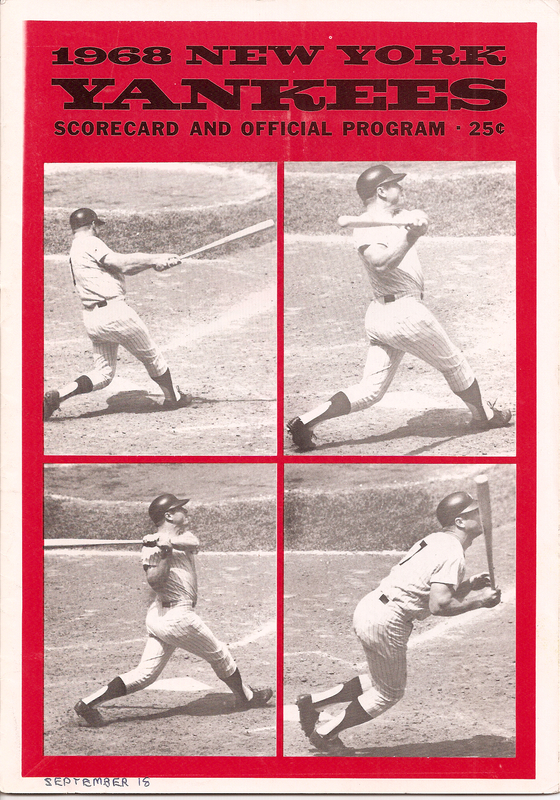 In the third inning, against Boston’s Jim Lonborg, Mantle – as the four horizontal lines suggest – homered. It was the 536th – and final – home run of his career. I saw Mantle’s last homer. But I remember the darkened Stadium much more clearly. If you’re wondering, this isn’t a bad scorecard for a nine-year old kid. I’ve already got the concept of marking runs batted in (the asterisks) although I was still dabbling with the backwards “K” for a walk. It was popular at the time. I only became a baseball fan in 1967 so I didn’t get to see very much Mantlean glory. But in addition to the farewell blast (which was also his next-to-last hit; he singled on September 25 versus Cleveland, costing Luis Tiant a no-hitter), earlier in 1968 I saw him hit a homer in the same game as a brash young kid from Oakland hit one. Fella was named Reggie Jackson. Don’t be fooled. The problem is much worse. conditions in which the homers have been hit. dead-center (and it may be awhile before we see anybody do that again). that I looked down, convinced the ball was foul, in the seats, and by a lot. Only four traditional in-the-seats homers were hit to left in the first two exhibitions and four regular season games. fence, if the new Stadium measurement was precisely the same as the old one). only explanation, or, far and away, the most important one. in April are not equivalent to the contrast between any April day and August. fifth homer of the blustery afternoon into the LF corner off Chad Gaudin. wall in center. Damaso Marte gives up blasts to Sizemore (RF) and Martinez (LF). locales in right, including two by righthanded batters (DeRosa and Jeter). are already up to 25 homers in five games here. colder. And we still get three more homers, two to rightfield. might be seeing homers rise as temperatures do. 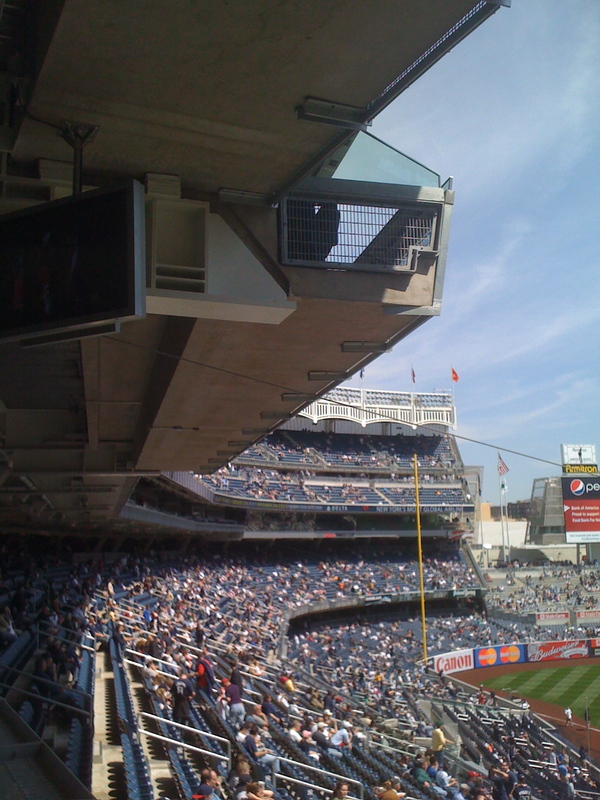 into the Yankee dugout, which can be used to stare daggers at Joe Girardi. Slaughter and a Duke Snider. two stops before The Stadium. Maddening, I tells ya. it once, but that brain cell is long since hors-de-combat. Anybody know?